Includes a plug-in programable thermostat that makes the heater even more efficient. Energy-Efficient - Save up to 70% on heating costs! The LCD display and electronic control panel on this ceramic heater are designed for ease of use. Electronic power settings & room thermostat and a 24-hour timer to set and automatically maintain the desired temperature. The motor-driven oscillation distributes warm air to multiple areas quickly and efficiently. A tip over safety switch automatically turns the heater off if it falls down accidentally. Stiebel Eltron's elegant surface-mount CK heater is perfect anywhere quick heat is needed. Designed and made in Germany, this quiet fan heater quickly warms an area or maintains a comfortable temperature. Perfect for both retrofit and new construction, the European downdraft design heats a space evenly. CK heaters easily replace older flush-mount heaters and are ideal for bathrooms, basements, offices, playrooms, 3-season porches, cabins, campers or RVs, and mobile homes. The built-in fan is extremely quiet in operation at only 49.7 dBA. A thermostat with an adjustable knob for setting temperature is located on the right side of the CK. In rooms larger than 215 sq. ft., the CK can be operated through a conventional wall-mounted room thermostat. The CK is designed with a frost-protection setting. The lowest thermostat setting will maintain above-freezing temperatures in an appropriately sized space. The external casing is made of stove-enameled sheet steel. The sides are made from plastic. The CK heater is designed to have its components recycled at the end of its useful life. Stiebel Eltron is a world-leading German manufacturer of technically sound products since 1924. 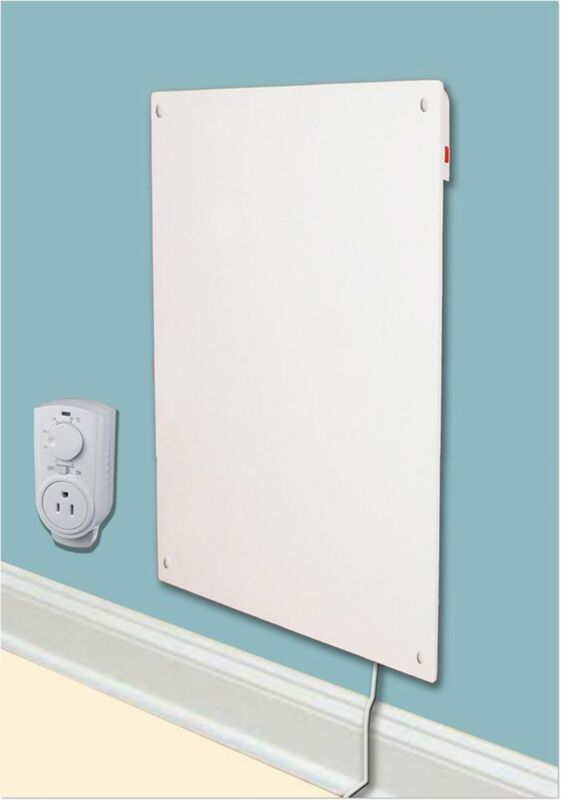 600w with Plug-in Thermostat Electric Panel Room Heater is rated 4.3 out of 5 by 31. Rated 2 out of 5 by Handyman 124 from The smell is very strong All other reviews regarding the smell are correct dont waste your time and money look at other heaters. Great idea and easy to use and install however it stinks like melting plastic. Rated 5 out of 5 by Pam55555 from Exactly what I was looking for I have had no problems. And no odours. I painted the heater to blend with my walls. The surface was easy to paint. Rated 5 out of 5 by Toasty Guy from Simple buy I bought this and it was shipped to us. Arrived the day they said, even though I had the postal code wrong. By the time I got home form work, my wife and daughter had it mounted on the wall, plugged in and working. It is nice to stand against when I am chilly. Rated 5 out of 5 by Cherry from Very Pleased Have had this for a few weeks now. Very pleased with heating capabilities and it had none of the chemical smell mentioned in other reviews. Would buy again! Rated 5 out of 5 by Chickenlady from Safe Safest heat source I have found yet for my chicken coop. No moving parts no fan to get plugged with dust. Takes up no valuable space at all. Keeps cool at a nice even 5 Celsius ideal for winter. Delivery of the unit fast. Rated 3 out of 5 by Kyle from Ok The heater looks great and works well, but it stinks like chemicals. Rated 5 out of 5 by Megamagoo from Really great Just bought and installed this a few days ago. It’s fantastic. Really good, efficient and provides a really nice heat. My space is double the square footage it was recommended for and I’m ordering a second one right now. Good product. I wouldn't recommend that. I doubt the unit has been tested for that purpose and likely could cause a short circuit and or a fire. With two heaters on the same circuit you would be close to maximizing a 15 amp breaker with almost anything else on the circuit. The unit is supplied to be plugged to a 120V electrical outlet by the user. If you want, it can also be hardwired by a certified electrician. The thermostat supplied is plug-in, so you won't be able to use it if the heater is hardwired. You may ask you electrician if they can connect the heater to work with a wall thermostat when the heater is hardwired. If this is installed on a wall that has a coat hanger above it can the coats touch the heater?? Do not cover the heater with anything including clothing or any other materials. Are there any restriction regarding bathroom installation of any of your Ceramic panels ? The heater can be used in bathroom areas but with the restriction not to use it where a person might be in contact with water and can operate the unit the same time. Never locate the heater where it may fall into a bathtub or other water container. Does the thermostat come with the heater? Yes, the item 1001072257 you inquire about is supplied with a Plug-in Thermostat included. Hi, I'm looking at buying one of these for my toddlers room instead of using baseboards...for safety. It says doesn't burn on contact. In your opinion, what if a blanket, bottle or teddy bear was up against it ? I guess you could mount it up higher?